The Poverty Concept. The Derivation of the Poverty Line. Determinants of Income. Determinants of Welfare Parameters. Determinants of Poverty. The Extent of Poverty. Description of the Data. Empirical Results: Differences in Welfare. Empirical Results: Determinants of Income. Empirical Results: Determinants of Welfare. Empirical Results: Poverty Lines and Poverty Determinants. Empirical Results: The Extent of Poverty. Conclusions. Bibliography. Index. 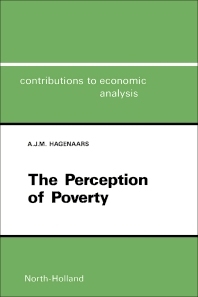 An attempt to define, measure and explain poverty is presented in this volume by means of a newly developed theoretical model. A combination of theory and empirical application is achieved by using the theoretical model on a sizeable data set derived from an extensive survey conducted in eight European countries. The nature of poverty is thereby empirically defined (and not a priori) as being the income level at which households feel that their income is just between sufficient and insufficient. An aggregate poverty index, associated with this poverty line definition, is calculated for each country and for subgroups within each country. Conclusions for social policy are drawn, describing which groups are at especially high risk of entering poverty, and who therefore need more specific policies. It is also discussed to what extent economic growth will eliminate poverty and which alternative measures are available.